This weekend, Savor Creperie, the relatively newly opened downtown Tacoma crepe shop, is having its grand opening celebration. Come celebrate Friday, June 21 and Saturday, June 22 and get great deals, samples and enter drawings for gift certificates. See the schedule of festivities below. Friday, June 21: Savor’s Grand Opening CELEBRATION! 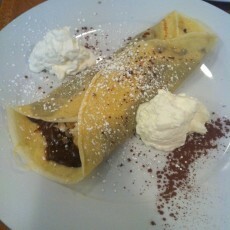 1/2 price sweet (dessert) crepes from 3:00 p.m.-7:00 p.m.
Saturday, June 22: Savor’s Grand Opening CELEBRATION Continues! I wrote about them right after they opened, and have been back since. 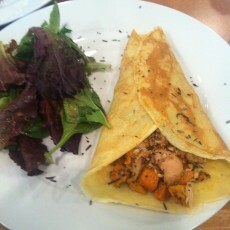 Each crepe I’ve tried has been fantastic. 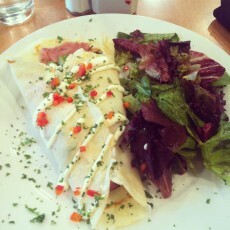 My personal favorite is the ham, gruyere and asparagus crepe with dijon creme fraiche ($9.50). As for sweet crepes, the banana, coconut and Nutella crepe ($6.50) was pretty delicious. 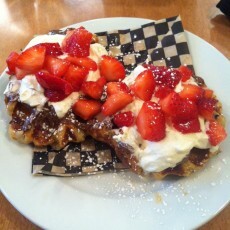 Savor Creperie also has liege waffles, a Belgian waffle that’s dense and sweet with caramelized sugar on the outside. You can top it with whatever you want, which is pretty fun. I had one with Nutella, strawberries and whipped cream. The atmosphere is fast casual. You order at the counter and they bring you your order to the table. A tip: If you’re planning on ordering both a savory crepe and a dessert crepe, order the savory one first, sit down and eat it, then order the sweet one for dessert. Then, your dessert crepe or waffle isn’t cold by the time you eat it. The owners, Tom Vigue and Vickie Black-Vigue are incredibly nice, and are bringing some needed dining variety to Tacoma. Help welcome them with open arms! Savor Creperie | 1916 Pacific Ave., Tacoma | 253-365-5534 | Open Monday-Friday, 11 a.m.-7 p.m., Saturday 8 a.m.-5 p.m.